Djerap is an amazing resource that has been a couple of years in the making. 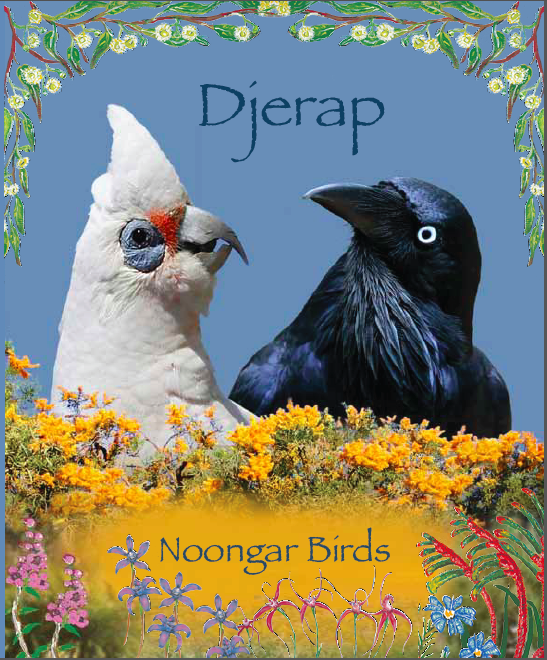 Djerap is a very significant publication because it is the first Noongar book to include the three contemporary Noongar dialects in one book. The bird photographs are amazing and are accomapnied by beautiful paintings of WA’s stunning wildflowers provided by Cheryl Martin and Theresa Walley. The fifteen stories in this collection were unearthed from the Battye Library achieves and are a unique compilation of legends from Bibulmun and Wardandi Noongar country documented by Debra Buller-Murphy. Buller-Murphy’s uncle, Alfred John Bussell who had also prepared a Dordenup Wongie manuscript of the dialect, compiled the word lists and examples of sentence in Buller-Murphy’s manuscript. It is with the authority and permission of Barbara Councillor that the Dordenap stories from Buller-Murphy’s manuscripts have been translated. Many of the stories in the manuscript are well known by Wardandi people and have been told and passed on through the generations. This unique work is published in the Noongar Dordenap dialect. The stories include true love stories, creation stories, stories of evil men conquered by great magic men and the story of the great shaking that changed the face of Noongar country. The book was published with permission from Barbara Councillor as senior custodian of this country. The book is accompanied by a comprehensive Dordenap word list, notes on the Dordenap grammar and a pronunciation guide. 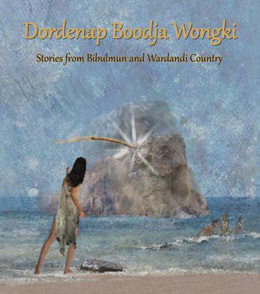 To assist in learning to listen to and read Dordenap Wongki the book is accompanied by an audio CD read by Charmaine Bennell. 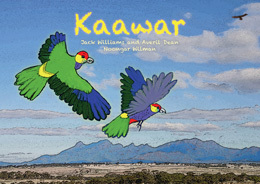 Kaawar Jack Williams and Averil Dean Noongar Wilman Kaawar is the story of how the red-capped parrots were scared by the waalitj (eagle) and as they scattered they scraped their legs across a hill in the Stirling Ranges in WA. The marks left by the Kaawar can still be seen, along with the pathways they created through the hills. The Noongar people always used these pathways created by the kaawar as they fled from the waalitj. This beautifully illustrated book has an accompanying audio CD with Averil telling the story for her family. 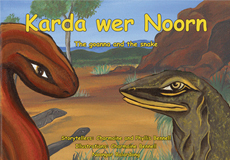 Karda wer Noorn is a bilingual book in Noongar Bardalong and English about how the snake got his beautiful colours. This book is a story told to Charmaine Bennell and her mother Phyllis by the late Glen Bennell to whom the book is lovingly dedicated. This title is available as a Book and Audio CD, a Resource CD, a Talking Book DVD and as a complete set. This children’s book in Noongar Balardong is about a family that goes for a drive and comes across a road kill. 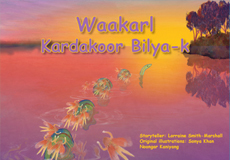 The accompanying audio CD includes a song and the story in Noongar Balardong. An A3 version of the book is available for teachers. A talking book is also available.N.B. these books do not include English translations. 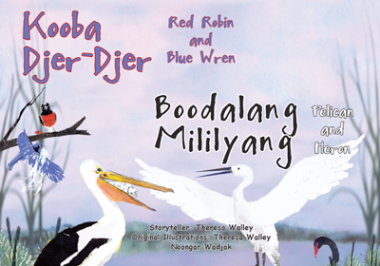 Kooba Djer-Djer wer Boodalang Mililyang are two bilingual stories in English and Noongar Wadjak. The tales tell of friendship and care and what can happen when people forget their friends.  Noongar elders think about the past and the impact of colonisation. 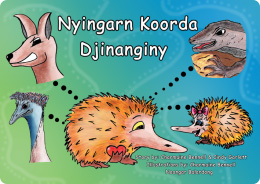 The B5 bilingual book in Noongar and English has an accompanying audio CD. 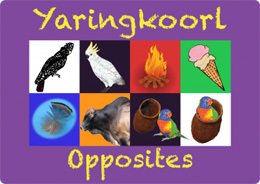 An A3 version in Noongar Balardong only and a resource CD for teachers are also available. 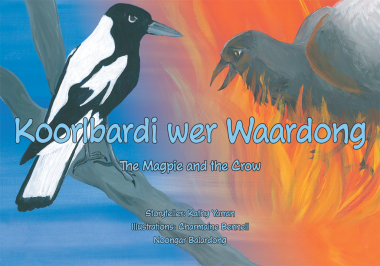 Koorlbardi wer Waardong tells the story of how the magpie and the crow got their patterns. 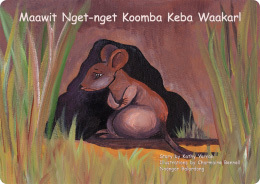 It is a bilingual children’s book in Noongar Balardong and English, and comes with an accompanying audio CD. A hungry mouse is looking for food when he comes to a waterhole. In order to claim it, he fights a water snake who lives there. 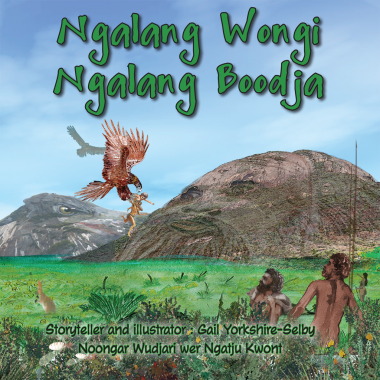 Bilingual in Noongar Balardong and English, the book comes with an audio CD of the story told in Noongar Balardong. 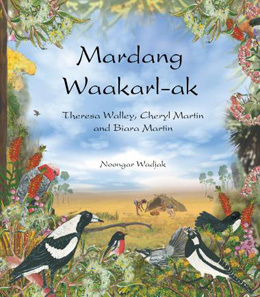 This book contains six Wadjak stories composed by Theresa Walley and illustrated by herself, her daughter Cheryl Martin and granddaughter Biara Martin. 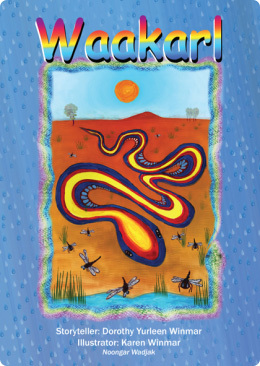 Yok Waakarl wer Yondok – Rainbow Serpent and Crocodile, tells of the creation of the rivers, lakes and waterholes is Wadjak country. It is a story of romance and courage as the mother Rainbow Serpent fights the crocodile from the north to protect Noongar Country. 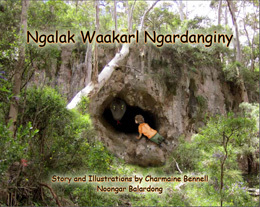 Many Noongar place names are included in this story as we travel with the Waakarl on her journey through Wadjak country. Joondia Jili Jili was a beautiful woman who tried to protect children from the evil magic man. Joondia Jili Jili threw the children into the sky to protect them and they transformed into the beautiful milky-way. Noompat wer Karda – The Numbat and The Racehorse Goanna were two friends; well that was before they wanted to dress-up and show off their teenage colours. This story teaches us about friendship, loyalty and those that have true talent. Pinjarra Waakarl is the protector of children and carer of Noongar people in the Murray River district, however this Waakarl is not so kind to those who want to disturb the tranquility and harmony of the Murray. Danakat is the tragic story of how seven sisters lost their lives while searching for their father. The story tells of a family’s love and devotion to each other and how they stayed together for eternity. 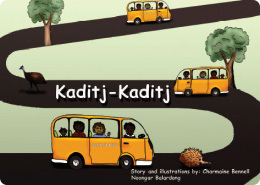 Koodjal Nop is a tale of what can happen when disobedient boys don’t obey their elders. Mirnang Waangkaniny tells of five important dreaming stories for the Albany region. 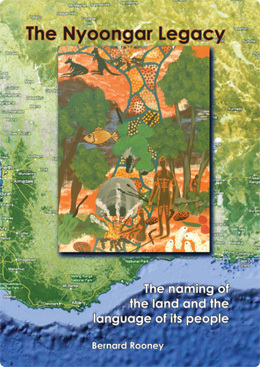 The book helps us to learn about Mirnang country, its ancestors and the creation of Albany’s beautiful and unique landscape. 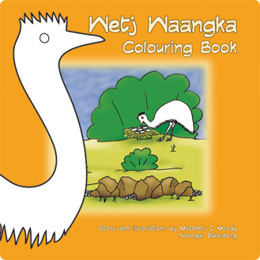 This beautifully illustrated book is written in Noongar and English so that the whole community can learn and appreciate the importance of Noongar culture. The author has included images of significant sites so that when you visit these sites you will know a little of their ancestral history. An audio CD of the author telling you their Dreamings in their mother tongue accompany each book. 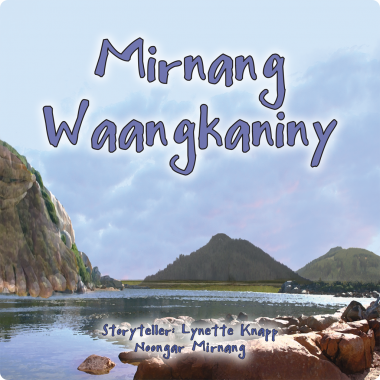 The author has taken care in the telling of these stories so that their children and all future generations of the Mirnang clan will be able to know the knowledge of their ancestors. 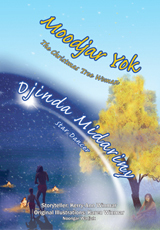 Moodjar Yok (Christmas Tree Woman) & Djinda Midariny (Dancing Star) are bilingual stories in Noongar Wadjak and English. These stories tell of Noongar caring for each other and their families. 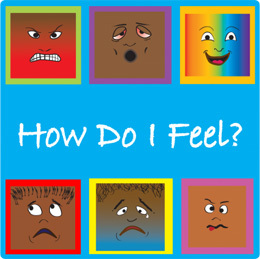 A brightly coloured children’s book illustrating various feelings and the words used to describe them. A young boy takes us on an adventure through Noongar country in search of the great Rainbow Serpent. The text invites young readers to join in the adventure as the boy makes his way through tall grass, thick forest, deep rivers and windy country until he reaches the dark, dark cave of the Waakarl. 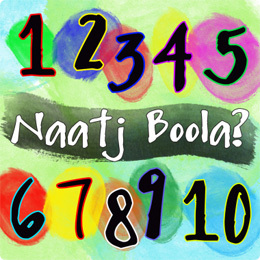 The story is structured to encourage learning Noongar sentence structure through repetition. At the end of the book there is a word by word Noongar to English translation, key word list and pronunciation guide to support teachers and learners. 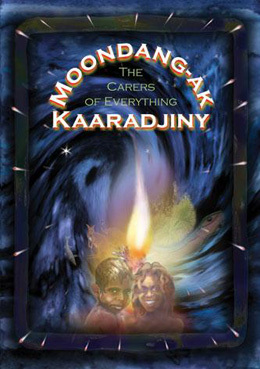 Ngalang Wongi Ngalang Boodja tells seven important dreaming stories belonging to the Noongar Wudjari and Ngatju clans. The stories teach us about the creation of significant sites in the Esperance region, their importance to Wudjari and Ngatu people and why this beautiful country is the way it is today. 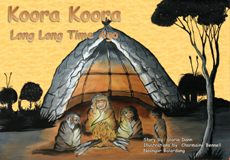 This beautifully illustrated book is written in Noongar and English so that the whole community can learn and appreciate the importance of Noongar culture. The author has included images of significant sites so that when you visit these sites you will know a little of their ancestral history. An audio CD of the author telling you their Dreamings in their mother tongue accompany each book. 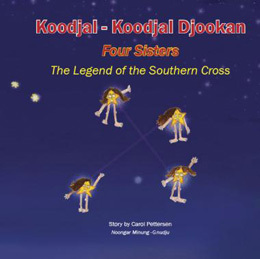 The author has taken care in the telling of these stories so that their children and all future generations of the Wudjari and Ngatju clans will be able to know the knowledge of their ancestors. Baby animals learn about their family relationships in this colouring book for young children. After asking several animals to be his friend and being rejected by all of them, Echidna feels lonely and sad. Luckily, a new friend is just around the corner. 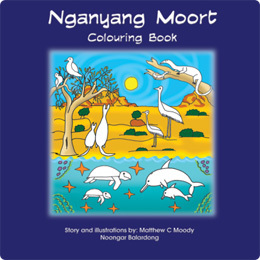 This bilingual book in Noongar Balardong and English comes in a B5 format with an accompanying audio CD in Noongar Balardong. 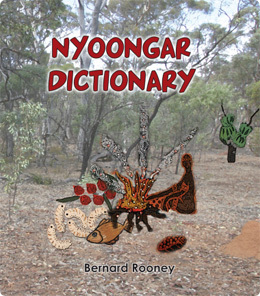 Nyoongar Dictionary by the Rt. Rev. Bernard Rooney OSB, Emeritus Abbot of New Norcia. The book includes a comprehensive dictionary of the Nyoongar language focusing on what is now known as the northern dialect. Divided into two sections, Nyoongar­English and English­Nyoongar, the dictionary is the result of the author’s own grass­roots experience of Nyoongar as a spoken language and offers the fruits of his extensive research into the available written sources. These sources include published dictionaries as well as unpublished word­lists dating back to the foundation of the colony of Western Australia. Each entry offers an interpretation of the source for a particular place and the possible or probable meanings. The book includes a comprehensive dictionary of the Nyoongar language focusing on what is now known as the northern dialect. Divided into two sections, Nyoongar­English and English­Nyoongar, the dictionary is the result of the author’s own grass­roots experience of Nyoongar as a spoken language and offers the fruits of his extensive research into the available written sources. These sources include published dictionaries as well as unpublished word­lists dating back to the foundation of the colony of Western Australia. Waakarl is the story of the Rainbow Serpent and how he brings rain to the people of Perth in the Swan River area. 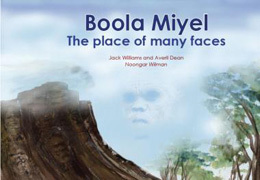 The book is a bilingual title in Noongar & English. 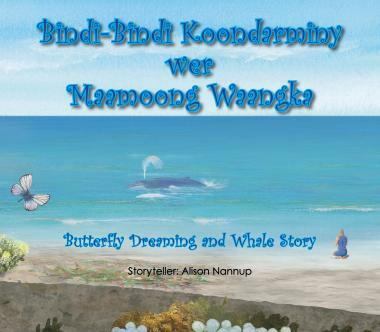 A bilingual book in Noongar Kaniyang and English about the Blackwood River Rainbow Serpent and Kaniyang spirits’ journey to the open sea. This beautifully illustrated book tells the story of how the Waakarl – (rainbow serpent) carries the souls the deceased Noongars along the Blackwood river and out into the Indian Ocean and their final resting place. 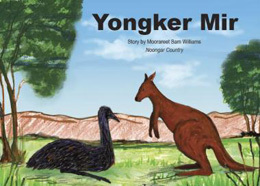 In this gentle story told in Noongar Balardong, a father emu takes care of his chicks. 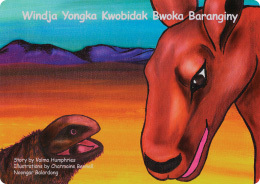 This bilingual children’s book in the Noongar Balardong language and English tells the story of how the kangaroo got his beautiful coat. A bilingual book in Noonagar Wardandi and English. 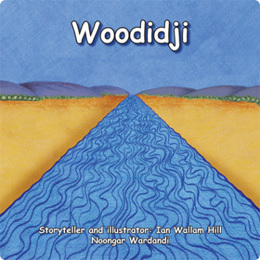 Woodidji is a creation story telling about love and loss and how and why the Margaret River was created. 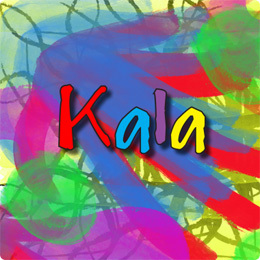 A colourful early childhood level book illustrating common opposites and the words used to describe them. A kangaroo drives his friends away by boasting and talking too much. 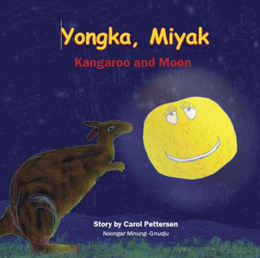 The kangaroo is lonely and makes friends with the moon. A lively contest follows, which the moon wins. Kangaroo, however, has the last say. A friendship between Kangaroo and Emu turns sour when Emu secretly takes food from their shared food stores. Kangaroo is killed in a fight with Emu. The place where he died is named Yongker Mir, after the story. To this day, kangaroos and emus do not share the same food places.